Bauxite, also known as alumina or monohydrallite, is white or gray white. It is brownish yellow or light red because of iron. Its hardness is 1~3 and it is crisp. The main component is aluminum oxide which is composed of hydrated alumina containing impurities and it is a kind of soil mineral. Bauxite is mainly used in aluminum, refractories, grinding materials, military industry, aerospace, communications, instruments, machinery, precision casting of medical instrument and other fields. Firstly, massive material is crushed into the feeding size (15mm-40mm) which can enter the mill by crusher. Small materials that meet grinding condition are transported to grinding chamber of the grinder uniformly and quantitatively by feeding system. Then they are ground to powder in grinding chamber. 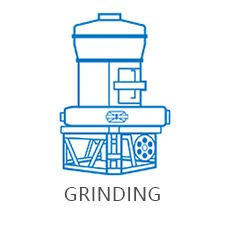 After grinding, the materials are graded by powder concentrator with system airflow. After grading, the unqualified powders will return to the chamber of the main engine for regrinding. The powders which meet the fineness are piped into powder collecting system with airflow. The air and the powders separate and finished powders are sent to finished products stock bin by conveying device. Then they are packed by powder tank or automatic packing machine together.